Was this story an encouragement to you? Let Bryall know - sign her guestbook! Bryall was 19 when she was diagnosed with osteosarcoma at the proximal humerus. Her treatments included chemotherapy and amputation. Prior to my diagnosis, I was a psychology student at the University of Auckland (New Zealand). I considered myself to be a fit and healthy young girl. I was very committed to tennis, which I was considering to be my career one day. But on September 27, 2008, my dream to become a professional tennis player was shattered. While I was playing a tennis match, I broke my right arm - and I hadn’t even hit the ball. My parent took me to the emergency clinic and when the doctor ordered an x-ray, it appeared that I broke my right arm at the humerus. Instead of just putting a cast on my arm he sent me to the hospital. I remember my mother questioned the doctor: "Why a hospital? It’s only a broken bone. You can put a cast on it." But the doctor explained to her that further investigation was needed to explain why the bone broke when I just lifted my arm. The ambulance took me to Middlemore Hospital. Upon arrival in the emergency department, the trauma doctor checked me and ran a blood test. He looked at the x-ray and both were negative, so he said he would refer me to Dr. French and Dr. Flint, bone tumor specialists. I asked him why he was referring me, and he said there must be something in the bone that was serious and needed further investigation. So I was admitted to the hospital, and on the following day Dr. French and a cancer nurse visited me. When Dr. French told me that I might have an osteosarcoma, which is a bone cancer, I cried. My first thoughts were for my parents. I was worried about how they would handle the news that their only child had cancer. I was a very fit and healthy girl, not even sick, how could I have cancer? Dr. French explained everything and he told me we needed to run more tests to be sure of the diagosis. I had an MRI, CT scan, and bone scans, but there was no sign of cancer growing and everything came back negative. Luckily, I have a very stubborn doctor. He performed an operation on my broken arm and got a little piece of my bone and sent it to the lab for a biopsy. On October 9, 2008, the biopsy confirmed that I had cancer. Altogether, it took 13 days for my doctors to diagnose osteosarcoma. I was sitting alone on our couch at home when the phone rang. When I answered the phone it was Dr. Flint, one of my specialists, confirming that I had a high grade osteosarcoma. After I hung up the phone I was crying and worried about how I would tell my parents. They were away and I didn't want to be the one to break the bad news to them, so I called our family friend whom I had known since I was a toddler. He was shocked and couldn’t believe it, but he told my parents. It was very hard, but my support was excellent. I remember that day all my friends came to our house and assured my parents and me that everything was going to be fine. These are the people that keep me going; their love and support made me stronger and helped me to believe that I would win this battle. I remember the advice of a very good tennis friend who told me that I might lose the first set, but she believed in me, and that I would win the second set and the third set. I put that in my head, and I thought of fighting the cancer as a tennis match. After the diagnosis, Dr. Flint referred me to the Auckland Hospital Oncology Department where I met Dr. Porter, an oncology consultant. He told me the plan: he said that I would have four cycles of chemo first in order to save my arm. November 1, 2008, was my first cycle of chemo treatment, Cysplatin and Doxorubycin. It was a whole day treatment for five days. I was bored on my first day of treatment; all I did was lie in the bed and go to the toilet. I was watching the clock ticking and couldn’t wait until 5pm because I was allowed to go home. I went home and was happy that I did not feel sick, but 9pm struck and I was sick as a dog. In our country we have a 24-hour help-line, so my mother rang them seeking assistance. The nurse told her to take me back to the hospital. I was admitted in the hospital for the rest of my first treatment in order to control the side effects of the chemo. I lost 14 kilos in one week. I was joking with my oncology registrar, Karen, that chemo is a very good diet. She laughed at me. I was very lucky because all my doctors and nurses were wonderful. I remember during my second cycle of chemo that I gave Karen a fright. Because I was so sick during my first cycle, Dr. Porter changed the anti-nausea treatment he ordered to give me a 24-hour automatic nausea release treatment. When Karen came to visit me the next day at 8am I was still asleep. So she left me alone and told my mother she would be back at 11 to talk to me, but when she came back I was still sleeping. She woke me up but I could not manage to stay awake for long. She jumped very quickly and ordered the nurse to remove the automatic release nausea treatment. Karen knew it was not the Bryall that she knows, because at that time she was the one who was doing all the talking. Mostly when they came to my room I was always making jokes with them. I worried her so much that she visited me three times that day. My nurses came and checked me every hour. I was very lucky to have a wonderful team that looked after me. My sense is humor helps me through it all, and being positive all the time really helps a lot. Although my boyfriend was not strong enough to stay around (he gave up after three month of facing the battle with me), I have a very strong support system that was enough for me. My mother's advice was that my boyfriend was not worth it. After four cycles of chemo, the CT scan and MRI showed that the cancer did not shrink. The good news was that I responded to the treatment well because the broken bone was healing, but it was not enough to save my arm. My doctor gave me 2 options: (1) keep my arm but risk a 50% chance that the cancer would come back or (2) amputate my arm and there was a 95% chance the cancer would be cured. To me I only had one option. I wanted to live longer. So, on February 4, 2009, Dr. Flint amputated my arm. Six weeks later I had another three cycles of chemo. Being an athlete for my whole life helped me to recover quickly. After six weeks of my last cycles of chemo I decided to take on other sport. I never waited for my physical therapy; I remained very positive about my life. 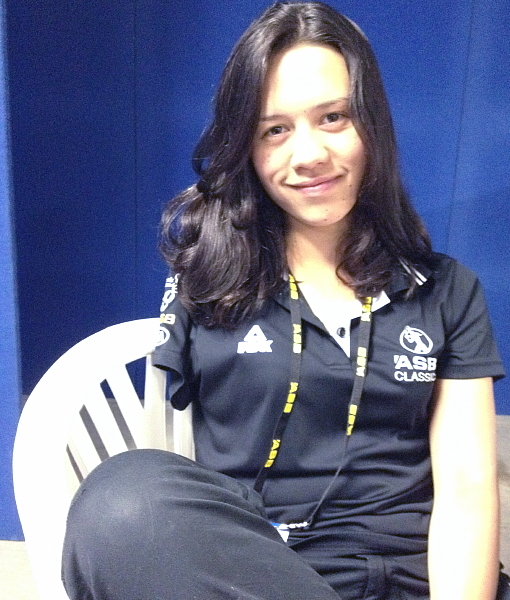 I went to a Paralympic New Zealand swimming try-out as a swimmer. I was selected as a swimmer xcellerate to xcellent. I’m back to university now, but I am taking a different course of study. I discovered that psychology is not my first choice anymore. I am a competitive swimmer, and I’m happy that I am back competing again, even though it’s a different sport. 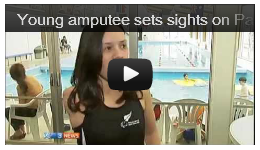 I hold 12 New Zealand records, and I competed in the Pan Pacific Paralympic Swimming competition last year in Edmonton Canada. 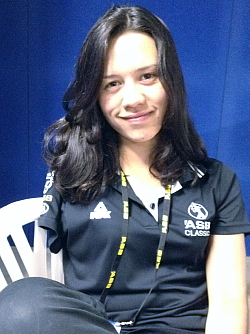 I received a bronze medal in 100 butterfly and also hold a 100 butterfly Oceania record. I also work as an international tennis line umpire. My life now is wonderful; I have opened doors that were closed before. I became an ambassador for the Relay for Life for the Cancer Society. I also do inspirational speaking for the Canteen (Cancer for Teenagers) and Cancer Society to raise money. I refuse to dwell on what might have been and instead have focused on what I have to do to adapt to life as an amputee and cancer survivor. My ordeal has taught me to value every day. I believe you should live your life to the fullest – you never know what is around the corner. Signatures in Bryall's Guestbook will appear here. Please share your thoughts!